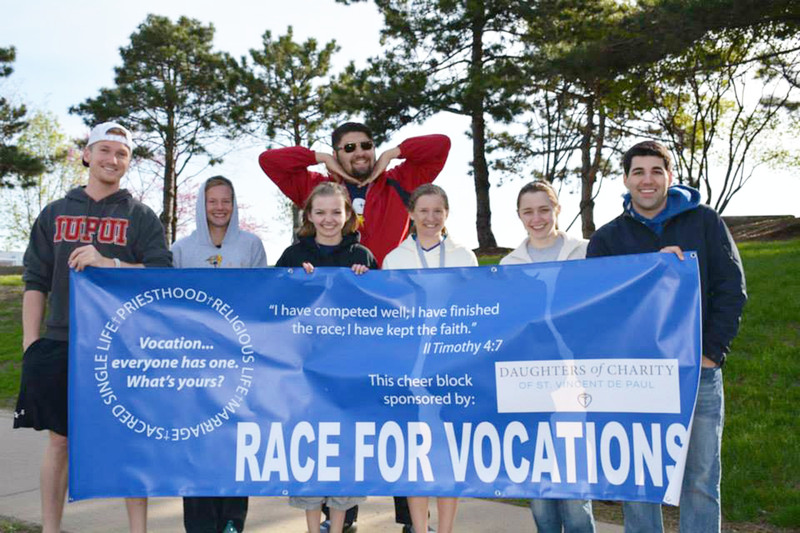 Running the race for vocations is not easy and participants depend upon those on the sidelines to cheer them on. Just as the Christian life would be impossible without the great “cloud of witnesses” (the saints) who surround us on a daily basis in the race of life, this race is also impossible to finish without the cloud of supporters on the side of the track. It’s amazing–after nine miles, right when a person is about ready to give up and stop running, he or she can easily be spurred on after friendly voices yell in support from the side! Parishes, Newman Centers, and other groups are encouraged to send cheer blocks to various spots along the side of the track. A map of the track is located here. We’ll provide a banner that says “Race for Vocations” to each cheer block and/or signs that can be held up. To request such a banner, just e-mail Megan Fish at mnfish25@gmail.com. You can also make your own. Once you have your banner, just show up somewhere along the track and cheer!